High school students in Columbia Falls, Mont., walked out of class to show their support of the Second Amendment on Wednesday. More students walked out of their high schools on Wednesday, but this time they were walking out to support the right to bear arms. 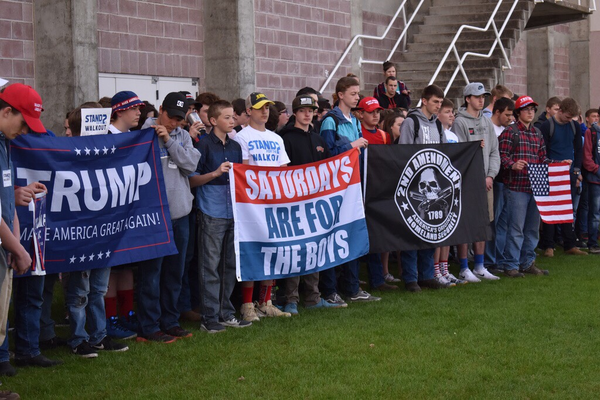 "Stand for the Second" was organized by Will Riley, an 18-year-old high school senior from New Mexico. "It all starts [with] myself and a few of my friends in my living room, making calls," he told NPR. The walkout comes on the heels of several larger, nationwide demonstrations that saw hundreds of thousands of students and other protesters call for gun control. Riley said he decided to act after the March For Our Lives rally, on March 25, in which survivors of the school shooting in Parkland Fla., led students across the U.S. to call for tougher gun legislation. He said he felt his generation was being portrayed as a unified front. "But we are not unified on this — there are two sides to every story." In a fiery op-ed in The Washington Examiner, Riley wrote, "I am disgusted by how these students and their adult handlers are trying to define my generation." He said, "These Parkland high school students do not speak for my generation," adding that there is "a battle for the very heart and soul of our country." Wednesday's walkout was scheduled to take place at 10 a.m. and last for 16 minutes — one minute fewer than another walkout, on March 14, that honored the 17 people who died in the Parkland school shooting. Riley said that more than 500 schools in nearly every U.S. state participated in the walkout. In his hometown of Carlsbad, N.M., he said that between 500 and 600 students took part. NPR could not verify these numbers, however. In northern Montana, about 100 students left their classrooms in Columbia Falls High School to stand outside on a grassy area near the gym, Montana Public Radio reported. They were mostly boys holding banners supporting President Trump, the Second Amendment and the U.S. flag. "Students like ourselves recognize the attacks on our rights and our future," said Braxton Shewalter, who led that walkout. "We also know that our silence won't cut it anymore, and we won't be silenced in the national debate." In Michigan, between 50 and 100 students gathered outside Grand Ledge High School, according to member station WKAR. A senior named Zach Bell, standing by a military honor guard, asked fellow classmates to remember the work of police officers and soldiers. "In some of my classes, I took a lot of flak for wanting to do this," the 18-year-old told WKAR. "But having all these students out here supporting me is really big to me, because it's a lot more than I had previously expected." Photos and videos of other students were posted on Twitter. A day after the walkout, Riley said he's thinking about what comes next. Stand for the Second, he said, is "basically just myself and a few of my friends, like four of us who are really organizing. ... We are all volunteers." But the effort did receive some support. The National Rifle Association provided them with some media contacts and recommended that they issue a press release to contacts in New Mexico, Riley said. The Tea Party Patriots also got involved. The conservative group published a sign-up sheet for students to attend or organize a walkout and hosted a map of participating schools and sent stickers with 'Stand for the Second' on them. "They helped me write up an organizer guide to help people really make sure it stays civil, make it a peaceful protest and help [students] organize at their schools," Riley said. "We're not done for standing up for constitutional rights."